It was late Spring and we were ready to row Play With Me. There weren’t many printables for this book, so I created a Play With Me printable pack, a vocabulary pack, and a few FREEbies. The kids helped put our Sensory Story Box together for this row. They set up a pond and meadow complete with animals and a little girl. It turned out adorable! Parker and I worked on the title page of his lapbook. I drew a quick sketch and he colored it in. I loved how the little girl learned to be quiet and gentle with the pond and forest animals. 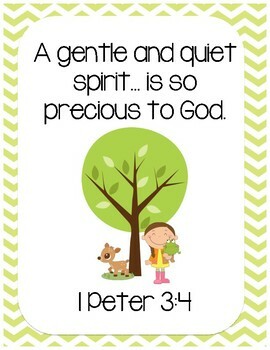 I chose to have the kids memorize 1 Peter 3:4 for this row. I created a Bible Verse Printable Pack you can download here for FREE! We chose to focus on gentleness while rowing Play With Me. Parker worked on his tracer worksheet. I kept our Bible verse puzzle on Learning Lane during our time rowing Play With Me. I created a separate Vocabulary Pack for Play With Me. You can purchase it here at our TPT Store. We used our vocabulary words in our Story Sensory Box. In the beginning, Parker matched the word card to the picture and found the actual item in our box. He continued to do this activity until he knew the words well. By the end of this row, he was able to read the word card and match it to the picture card. I set out the “By the Pond” reading page from Homeschool Creation’s Pond pack. I color-coded the words and gave him matching colored gems. He read the word, found the word, and placed the matching color gem on it. I set up a “Read & Feed” the frog activity on our Learning Lane. Parker read and fed the frog “flies” (frog affix center – Differentiation Station) on our learning lane. I gave him various words to “read & feed” the frog when our flies ran out! I created a Starting Sounds Phonics Match activity our Play With Me pack. Parker matched all the letters to the pictures with the same starting sound. I added some Pond phonics clip cards (Mommas Monkeys) to our Learning Lane. I set them out with a basket of gems. Parker did a great job marking the starting sounds. I switched to another set of Pond phonics cards (Homeschool Creations) and presented them with gems in a basket. Parker marked the starting sounds with the colorful gems. I pulled out our pond spelling cards (2 Teaching Mommies) and covered the letters with black construction paper and set out the letter tiles for Parker to spell each word. He sounded out the word placing the letter tiles in each black box. He diligently worked through whatever words were in Learning Lane that day. This week Jordan was working on root words and suffixes. I set up a build your spelling words activity. I wrote the root words on the lilly pads and suffixes on the waterlillies. Jordan built his words and wrote them down on his paper. 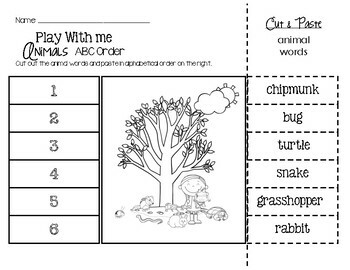 I made a Play With Me ABC Order worksheet since Jordan was working on alphabetizing this week. Jordan cut and pasted all the words in alphabetical order. Great job Bub! We brought out many of our pond themed counting activities. I set out a tray with a Counting Fun worksheet (1+1+1=1) and some mini pond stickers. Parker stuck the pond stickers while counting each row. Representing the Meadow, I brought out our foam trees, some acrylic leaves, and a dice. Parker rolled, counted, and placed the leaves on the tree. I used the frog counting puzzles (Momma’s Monkeys) for Parker to do an even and odd sorting activity. My kids LOVE the which one is different worksheets. I added two versions in our Play With Me printable pack. Parker worked on the Easy Level I set out on our Learning Lane. I added a Pond Which One Is Different? (Homeschool Creations) in our Learning Lane. I set out our Play with Me Shadow Match on a tray in Learning Lane. Parker matched all the pictures to their silhouettes. I added another shadow match activity from Mama’s Monkeys. Parker worked on a pond pattern worksheet (Momma’s Learning Corner). I had him write the type of pattern too. I set out a Pond graphing activity in our Learning Lane (Momma’s Monkeys). Parker LOVES graphing activities. He rolled and covered the boxes until he had a winner! After graphing, he completed the coordinating worksheet. Parker LOVES math activities, so we tried to incorporate some addition and subtraction equations in Learning Lane. I brought out our Spring Birds file folder activity (123Homeschool4me). He matched the birdie equations to the nest numbers. I cut out lillypads out of green construction paper and wrote subtraction equations on one side and addition equations on the other. Then I cut out pink construction paper water lillies and wrote the answers. I set them out on a blue “water” tray with colored gems in our Learning Lane. Parker used the gems to help him add/subtract to find the answer to each equation. Once he figured out the answer, he placed the lilly with that number on top. He did a great job! I found a butterfly equation worksheet (3Dinosaurs.com) from Haley’s preschool days and placed it on our Learning Lane with magnet letters. Parker counted each set of butterflies and set the correct magnet letter on top. Then he solved each equation and placed the matching number at the end of each equation. 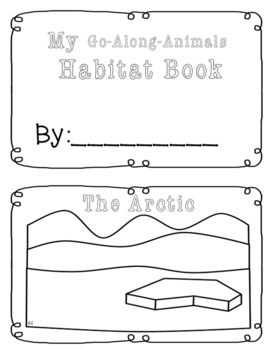 I created a Habitat Book for the kids to use to categorize the animals from each book we row. In addition, I created a set of My Go-Along-Animals to accompany each of the BFIAR book. I collected everyone’s Habitat Booklet and set them out the night before. We read about both the wetland and meadow/woodland habitats. I printed and handed out a copy of the Play With Me Go-Along-Animals to each child. They colored their animals and glued them to the pages in their booklet. 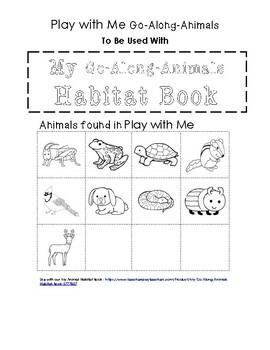 I created a habitat sorting activity in our Play With Me Printable Pack and placed it in our Learning Lane. Parker sorted through the pictures placing them in the correct habitat. We started our Pond unit with Song of the Water Boatman and a fun breakfast. The kids gobbled their breakfast while I read several pieces of poetry. 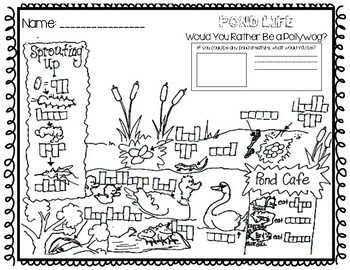 I created hand-drawn Pond Life worksheets for the kids to color and complete while reading Would You Rather Be a Pollywog?. I posted it here on our TPT Store. The kids had fun doing this activity! They turned out SO colorful! We read some non-fiction books about ponds. 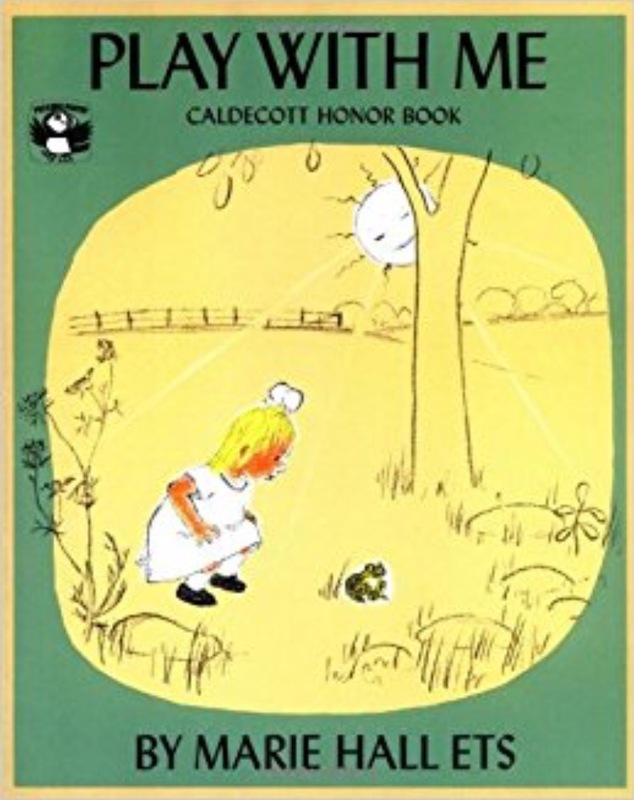 We also read some adorable picture books about ponds. The kids enjoyed a fun pond-themed lunch with turtle sandwiches, carrot & hummus dragonflies, and a berry pond with cucumber lily pads. 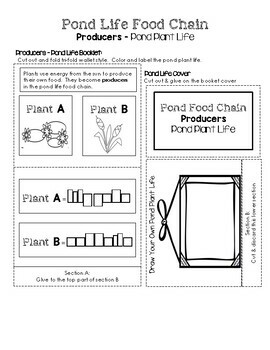 I created a few new pond life lapbook inserts for the kids to put in their lapbooks. 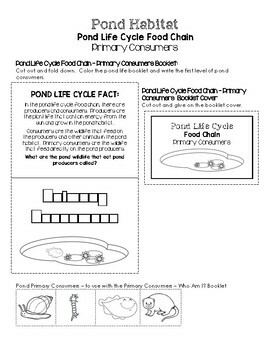 We read more about pond life as we focused our attention on the pond food chain. The kids added some dragonfly (education.com) and grasshopper inserts (lapbooklessons) into their lapbooks. I found an awesome Pond Food Web resource from Discovering New Mexico. 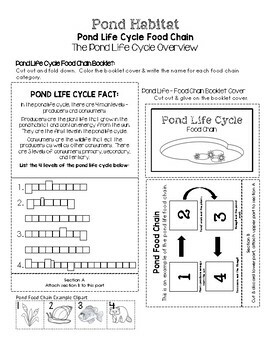 You can download cards and other resources to help you teach your class about pond food webs. While learning about pond life, I gave the kids a pond fishing snack to munch on! We visited the creek near our house to observe some of the cool water creatures we were studying. You can see algae and there were plenty of areas with duck weed too! Just like the little girl in the book, we had to quiet ourselves to observe nature. Once our bodies were still, we started seeing pond life darting all around us! We kept scooping up water to observe little fish, pollywogs, and other creatures. Most of this unit was centered around the pond habitat, but we had to give our meadow friends a portion of our time. We read Crinkleroot’s Guide to Knowing the Birds by Jim Arnosky. The kids really enjoyed reading other Crinkleroot books during The ABC Bunny. Then we read The Empty Lot, a really cute book about birds, trees, and meadow woodland habitats. The kids completed their “Who Am I?” Lapbook inserts (HomeschoolShare). We did a little turtle learning while studying the pond habitat. We read All About Turtles and I set out a label the turtle activity in Learning Lane. I set out our Montessori turtle puzzle with label cards (The Helpful Garden). We also read about the turtle’s lifecycle in A Turtle’s Life. The Acorn books are great for mixed ages! I cut out poster board parts of the turtle for each child and laid them on trays with green and brown tempura paint. The kids painted their turtle parts and we set them aside to dry. later, we hot glued the parts together to form our turtles. The kids added glitter glue and various green objects I collected and cut up for them. Then their imaginations took off…. They gave their turtles googly eyes, sparkling jewels, and whatever else their imaginations called for. They all turned out creative, colorful, and darling! I added a “How to Draw a Turtle” activity in our Learning Lane. I started adding more art tutorials to our Learning Lane since Parker showed more interest in drawing this year. He did such a great job drawing his turtle and labeling it. I’m so proud of the progress he’s made this year! We couldn’t study pond life without learning a little more about our favorite leaping amphibian. We started our frog lessons with a froggy lifecycle breakfast. I read Tadpoles and Frogs and From Tadpole to Frog while the kids gobbled through the frog lifecycle! After breakfast, the kids colored A Frog’s Life worksheet (The Education Center). We read more books about frog lifecycles and I set out a frog lifecycle activity on Learning Lane (education.com). Parker worked on the Lifecycle of a Frog activity. We read The Frog in the Pond and I brought out a Label the Frog worksheet (Mama’s Learning Corner). The kids colored their frogs. Cut out and glued the labels on the parts of the frog. Parker worked on a label the Frog Parts activity (2 Teaching Mommies) in our Learning Lane. We read some really cute frog picture books. The kids used the “How to Draw a Frog” activity (Blue Tadpole Studio) art tray I set up in Learning Lane. The kids also did a cute frog-themed creative writing assignment. I added a cute Five Little Frogs activity on Learning Lane. Parker did a “Do You Love Frogs?” survey for our homeschool friends and family. We wrapped up our row with Mossy by Jan Brett and a sweet treat for the kids to enjoy while listening to our story. The “build your own pond” cookie was a simple sugar cookie, gummy frogs, butterflies, marshmallow ducks, and a fruit roll up cut to look like lilly pads. The kids LOVED decorating their pond cookies! I read Mossy while they nibbled their cookies. Everyone LOVED this precious story! I printed a copy of the Jan Brett Mossy pictures for each child. They cut out and created their own unique Mossy page to complete their Play With Me lapbooks. What a precious time we had rowing this book! You can find most of the books, activities, and printables we used on our Play With Me Pinterest Board. Our Play With Me Playlist is packed with clips about ponds, meadows, frogs, insects and so much more. We use our playlist to supplement learning and to occupy their creative minds while playing or coloring.